Everyday life, no whether the issues or events arise next-door or a continent away, raises questions and concerns that the public counts on journalists to answer and, more important, confront. More than ever before, we all rely on the news media for warnings, explanations and insights. The profession - and society - cannot afford lazy, inept, uncommitted journalists. Today's reporters must learn how to cover public affairs intelligently and thoroughly. First you must learn about the institutions and people who influence the news; understanding how a legislative conference committee functions or how a trial is conducted remain important pre-requisites. But it is not enough merely to know how to report. Journalists must also understand how they see, define and influence the news. Don't be fooled by the daily dose of fluffy stories about fads, fashions or fetishes. People love to revel in celebrity gossip or fantasize about extreme makeovers. But Donald Trump's love life or the South Beach Diet don't satisfy when people worry about a home invasion in their neighborhood or a rezoning proposal to bring a Wal-Mart super center to town or a Department of Education report that their child's school scored bottom-most in reading achievement. 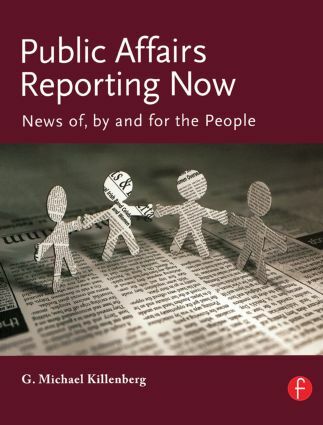 Public Affairs Reporting Now is intended to teach you the best practices and give you the best advice for covering what's generically known as "public affairs reporting. It's a term that's neither inspiring nor precise, but it's long been a convenient way of describing the kind of news coverage that keeps people informed as citizens and keeps our institutions, public and private, focused on the public good. Why Focus on the Neighborhood? What's Wrong with Education - and What's Right? G. Michael Killenberg is professor and founding director of the Department of Journalism and Media Studies at USF St. Petersburg, a Program of Distinction at the university. He joined USF in 1988 after 15 years at Southern Illinois University at Edwardsville, where he was director of graduate studies in mass communications. In his professional career, he has been a reporter and editor for weekly and daily newspapers, including the Los Angeles Times and the St. Louis Globe-Democrat. His publications have focused on media law, community reporting and ethics in news interviewing. He is the author of Public Affairs Reporting: Covering the News in the Information Age (1992), and co-author of Before the Story: Interviewing and Communication Skills for Journalists (1989); The Conversation of Journalism: Community, Communication and News (1994); and Interviewing: Speaking, Listening and Learning for Professional Life (1999). In 1998, he received the USF Professorial Excellence award.